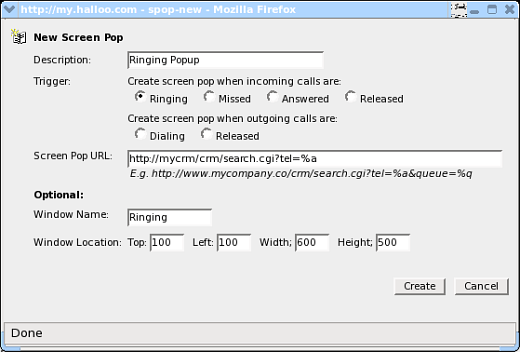 A Screen Pop is a window which opens on your agents’ computer when a call related event, such as the arrival of an incoming call, occurs. The new window is created by the Agent Console which opens to a URL that you configure. This URL is typically a pointer to a web based CRM database record containing information relating to the person calling you. Notice that the telephone number is supplied as an argument to the search.cgi script. Your system will differ from this example. Screen pops are configured globally, for all queues and agents. To create a new screen pop rule, open the All Extensions → Screen Pops page. You can also give the popup window a window name and screen location. Doing so will insure that your popups open into the same window for each new call, rather than opening blank windows for each new call.